The word “Splurch” comes to us from the Indo-European “Splurchenous” which was an adjective describing that feeling you get when you’re headachy and nauseous at the same time, ready to draw the blinds, lie down and breathe slowly, hoping the bad thoughts won’t come again, the ones that tell you to throw the couch out the window and scream insults at Janet Reno, daring her to send the black helicopters and her legions of jack-booted thugs. Move over, Mary Ann Singleton. Here comes Holly Chen. 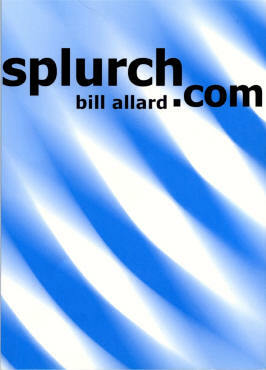 Holly Chen, 22, is an associate producer in a soon-to-go-public dot com company, splurch.com, and one of the central characters in a new novel by Bill Allard, which bears the same name. Holly works with an oldtime hacker named Norm Dotoshay and a young bike-riding computer whiz, Salvidor Zaldivar. The time is December 1, 1999 - May 1, 2000. The place is Multimedia Gulch and points south. Or join Holly’s boss, splurch.com CEO Milena Peterson, as she heads to work in her Mercedes SLK, her headlights illuminating “block after block of dilapidated warehouses, ancient auto parts stores, and billboards announcing the arrival of yet another indispensable dot com web site.” Next to Milena, on the passenger seat, is a bag of Christmas decorations, destined to festoon computers and white boards. “Steve Jobs wouldn’t do this at Apple,” she mutters. Norm and Sal tried to take the loft by charging up the red metal circular stairs but were driven back by Holly and her sales cohorts. When the loft team ran out of water balloons, they started throwing stacks of recycled paper down on their attackers. Sal finally gained the loft and chased Holly down the stairs blasting her with his over sized water gun. As they reached the bottom of the stairs, Holly tripped over Norm’s foot and crashed into the Foosball table. No, Toto, we’re not in Kansas any more, nor in Manhattan. Maybe they would turn Alcatraz into a debtor’s prison and incarcerate her and all the other dot com executives that lost their stockholders so much money in the last couple of days. The more she thought about it, the better it sounded. Three squares a day and somebody else to figure out how to drag the stock out of the gutter. Holly sat down on the bench and looked through the windows of the Ecco restaurant. Laughing patrons were enjoying their Sunday brunch. At the front counter a line of people waited for a noon jolt of joe to go. Christmas was only a week away, but appeared that none of these web workers were taking time off to Christmas shop. Maybe if they worked hard enough, their dot com company would go public that much sooner and they would become dot com millionaires that much sooner, and then they would be able to take luxurious vacations and buy their loved ones expensive Christmas gifts.